With two eclipses and a major meteor display, August is 2017’s most interesting month for sky-watchers. Admittedly, Scotland is on the fringe of visibility for both eclipses while the annual Perseids meteor shower suffers moonlight interference. The undoubted highlight is the so-called Great American Eclipse on the 21st. This eclipse of the Sun is total along a path, no more than 115km wide, that sweeps across the USA from Oregon at 18:17 BST (10:17 PDT) to South Carolina at 19:48 BST (14:48 EDT) – the first such coast-to-coast eclipse for 99 years. Totality is visible only from within this path as the Moon hides completely the dazzling solar surface, allowing ruddy flame-like prominences to be glimpsed at the solar limb and the pearly corona, the Sun’s outer atmosphere, to be admired at it reaches out into space. At its longest, though, totality lasts for only 2 minutes and 40 seconds so many of those people fiddling with their gadgets to take selfies and the like may be in danger of missing the spectacle altogether. The surrounding area from which a partial eclipse is visible even extends as far as Scotland. From Edinburgh, this lasts from 19:38 to 20:18 BST but, at most, only the lower 2% of the Sun is hidden at 19:58 as it hangs a mere 4° high in the west. Need I add that the danger of eye damage means that we must never look directly at the Sun – instead project the Sun through a pinhole, binoculars or a small ‘scope, or use an appropriate filter or “eclipse glasses”. A partial lunar eclipse occurs over the Indian Ocean on the 7th as the southern quarter of the Moon passes through the edge of the Earth’s central dark umbral shadow between 18:23 and 20:18 BST. By the time the Moon rises for Edinburgh at 20:57, it is on its way to leaving the lighter penumbral shadow and I doubt whether we will see any dimming, It exits the penumbra at 21:51. Our charts show the two halves of the sky around midnight at present. 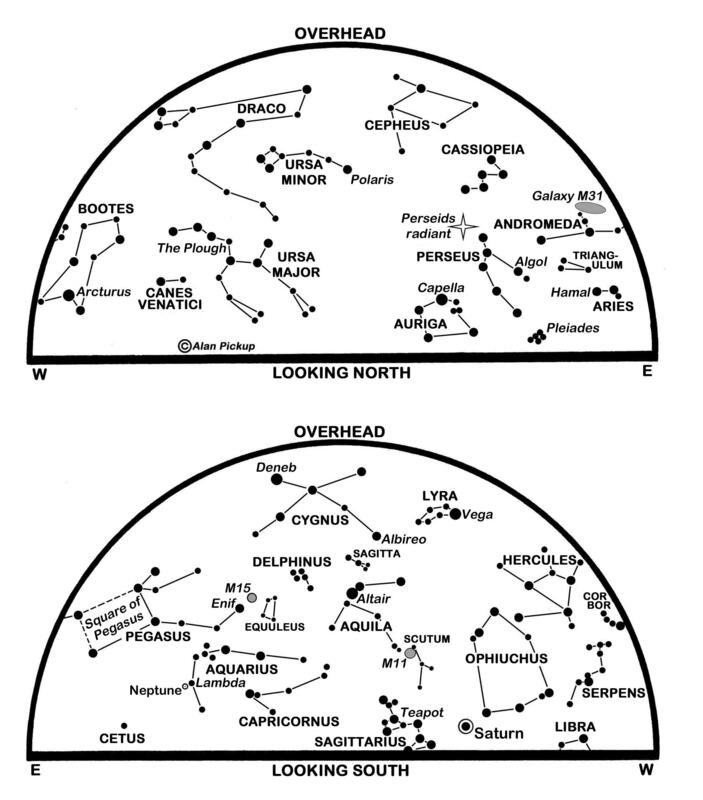 In the north-west is the familiar shape of the Plough while the bright stars Deneb in Cygnus and Vega in Lyra lie to the south-east and south-west of the zenith respectively. These, together with Altair in Aquila in the middle of our southern sky, make up the Summer Triangle. The Milky Way flows through the Triangle as it arches overhead from the south-west to the north-east where Capella in Auriga rivals Vega in brightness. Of course, many of us have to contend with light pollution which swamps all trace of the Milky Way and we are not helped by moonlight which peaks when the Moon is full on the 7th and only subsides as last quarter approaches on the 15th. New moon comes on the 21st and first quarter on the 29th. The Sun, meantime, slips another 8° southwards during the month as sunrise/sunset times for Edinburgh change from 05:17/21:20 BST on the 1st to 06:15/20:09 on the 31st. Meteors of the annual Perseids shower, the tears of St Lawrence, are already arriving in low numbers. They stream away from a radiant point in the northern Perseus which stands in the north-east at our map times, between Capella and the W-pattern of Cassiopeia. We spot Perseids in all parts of the sky, though, and not just around Perseus. Meteor numbers are expected to swell to a peak on the evening of the 12th when upwards of 80 per hour might be counted under ideal conditions. Even though moonlight will depress the numbers seen this time, we can expect the brighter ones still to impress as they disintegrate in the upper atmosphere at 59 km per second, many leaving glowing trains in their wake. The meteoroids concerned come from Comet Swift-Tuttle which last approached the Sun in 1992. Although Neptune is dimly visible through binoculars at magnitude 7.8 some 2° east of the star Lambda Aquarii, the only naked-eye planet at our map times is Saturn. The latter shines at magnitude 0.3 to 0.4 low down in the south-west as it sinks to set less than two hours later. It is a little higher towards the south at nightfall, though, where it lies below-left of the Moon on the 2nd when a telescope shows its disk to be 18 arcseconds wide and its stunning wide-open rings to span 40 arcseconds. Saturn is near the Moon again on the 29th. Jupiter is bright (magnitude -1.9 to -1.7) but very low in our western evening sky, its altitude one hour after sunset sinking from 6° on the 1st to only 1° by the month’s end as it disappears into the twilight. Catch it just below and right of the young Moon on the 25th. Venus is brilliant at magnitude -4.0 in the east before dawn. Rising in the north-east a little after 02:00 BST at present, and an hour later by the 31st, it climbs to stand 25° high at sunrise. Viewed through a telescope, its disk shrinks from 15 to 12 arcseconds in diameter as it recedes from 172 million to 200 million km and its gibbous phase changes from 74% to 83% sunlit. As Venus tracks eastwards through Gemini, it passes below-right of the star cluster M35 (use binoculars) on the 2nd and 3rd, stands above-left of the waning earthlit Moon on the 19th and around 10° below Castor and Pollux as it enters Cancer a few days later. On the 31st it stands 2° to the right of another cluster, M44, which is also known as Praesepe or the Beehive. This is a slightly-revised version of Alan’s article published in The Scotsman on July 31st 2017, with thanks to the newspaper for permission to republish here.